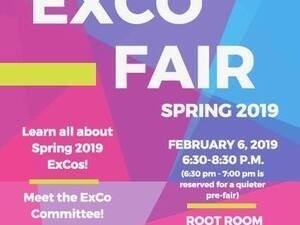 Add-drop is one of the busiest weeks of the semester, but it also means that one of Oberlin’s best events will occur: the ExCo Fair! Come learn about the 60+ incredible ExCo's being offered during the spring semester! Apply for the classes that interest you. Learn about potentially teaching a course in the future. Meet the ExCo Committee and so much more. Note: 6:30-7 pm is reserved for a quieter pre-fair experience. We ask that students and instructors speak quietly in order for the fair to be accessible to all.